ShopElefanteMusic.com is the online store and online instrument rentals platform for Elefante Music & School for the Performing Arts in New Providence, NJ. Instrument rentals can be ordered and delivered free to most area schools. There is also an expansive marketplace for musical instruments, accessories, method books, and gifts, with more inventory added regularly. Elefante Music & School for the Performing Arts, family-owned since 1996, is the most trusted music, performing arts, and instrument rental business for New Jersey families, offering the highest quality service at reasonable prices. Al Elefante attended Newark and New Providence public schools before graduating from New Providence High School. He went on to receive a B.A. from Kings College and study music performance at Manhattan School of Music. He studied clarinet with Charles Passhaus, Charles Russo, and Leon Russionoff. After a stint in the U.S. Army Band, he attended Dorn & Kirschner's repair school and worked as a musical instrument repair technician there until 1992. After D. & K. closed in 1992, Al continued to repair instruments and teach private woodwind lessons on his own. In 1996, Al was teaching about 20 private students out of his home when the opportunity arose to rent three small rooms in the second floor of a rundown building at the corner of Springfield Union Ave. in New Providence. 2 years later, Al took over the whole second floor. In 2000, he bought the building, and a year later undertook a complete renovation, doubling its size. 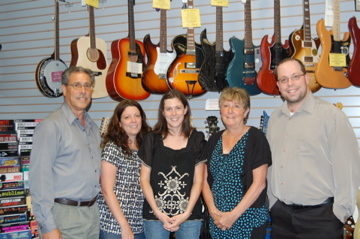 Al's daughters Stefani and Michele joined the company after finishing college. Stefani graduated with a B.A. in Psychology from Rutgers University. Michele graduated with a B.A. in Business Management, also from Rutgers. Since then, mom Betty Ann and son Joe have also signed on, making it a true family business! Today, Elefante Music has over 600 students and rents instruments to thousands of school music students throughout New Jersey. Here at Elefante Music we pride ourselves in giving our customers the absolute best quality instruments and service at reasonable prices. Elefante Music is a proud member of The National Association of School Music Dealers.